HOME SWEET HOME! This CUSTOM home in HERITAGE LAKE (with the option of buying 3 ADDITIONAL adjoining lots to the property) overlooks a partially wooded back yard and to side of the house (approx 0.85 acres). 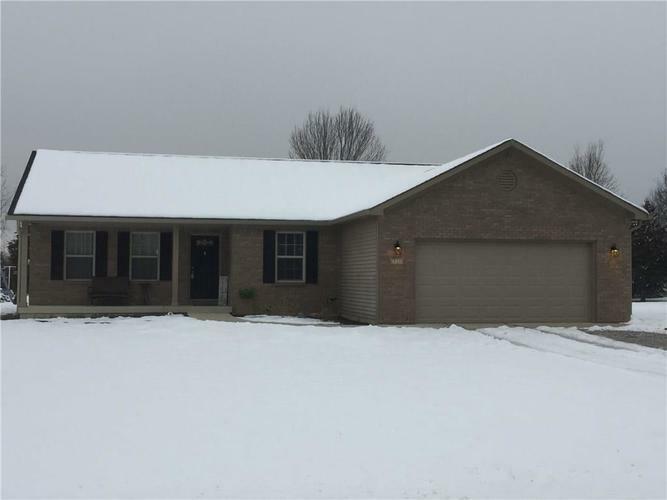 This WELL-MAINTAINED,MOVE-IN READY home has an open concept kitchen and living room. Kitchen has recessed lighting, offers a lot of cabinet storage, stainless steel appliances with a 6' large island/breakfast bar, 1/2 " hand scraped laminate thru living space, dark merlot cabinets in kitchen, upgraded trim, tiled laundry and bathrooms, overhead lighting and ceiling fans in ALL bedrooms and a climate controlled crawl space. Sit out back on your patio and enjoy mother nature in your own back yard. This lovely home won't last long!!!!! Directions:US 36 West of Danville to SR 75. Left/South on SR 75, Right/West on CR 150 S. Go approximately 4.5 miles to Heritage Drive, Left on Heritage Drive to Monmouth, Left on Militia and home is on the Right.